Drum Corps International's senior manager of tour and special events, Sue Kuehnhold, this week celebrates her 10th anniversary with the company. Her anniversary date is Dec. 1, 2006. Prior to the start of each drum corps season, one of Kuehnhold's main duties is coordinating a schedule of the more than 135 events on the annual Summer Music Games Tour. She works directly with the drum corps to make sure they meet compliance standards and also supports and handles the contracts for the Tour Event Partners who run Drum Corps International sanctioned events. "Sue Kuehnold's job at Drum Corps International is similar to the challenge of putting a giant jigsaw puzzle together. Each drum corps and Tour Event Partner is intimately familiar with their piece of the puzzle, and no one knows how all of the pieces fit together better than Sue," said Bruce Brown, chairman of the Tour Event Partner Advisory Committee. Brown also runs a Drum Corps International event each summer in Cincinnati. 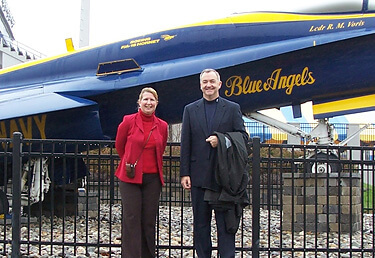 Sue Kuehnhold with DCI's executive director Dan Acheson during a recent visit to Navy-Marine Corps Memorial Stadium in Annapolis, Md. Any special events happening outside of the drum corps stadium like marketplace entertainment, stadium decoration, awards and opening ceremonies, also is Kuehnhold's gig. She led the organization and management of the 2004 Tour of Champions to California and the DCI Honor Corps that performed in the 2005 Walt Disney World Christmas Day Parade in Orlando, Fla. In addition to working as a special education teacher prior to joining the Drum Corps International team, Keuhnhold was a member of the Pride of Cincinnati drum corps for several years and worked on the administrative teams of Suncoast Sound and the Blue Knights. "Sue has done a masterful job of serving the drum corps community. She is a consummate professional and the personification of integrity, work ethic and excellence. She handles her duties with finesse and as a result has earned the continued respect of the corps directors and Tour Event Partners," said Drum Corps International Executive Director Dan Acheson. Congratulations on 10 great years, Sue!